The Reserve Bank believes we're out of the woods. Its statement released after today's board meeting says "labour market data and a range of business surveys suggest growth in the economy may have already been at or close to trend for a few months". 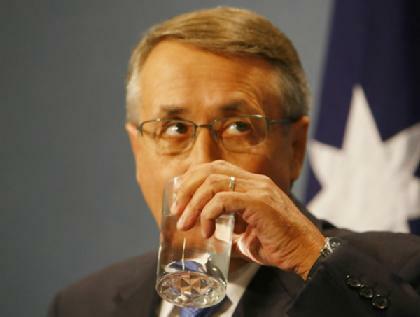 Wayne Swan doesn't buy it. Asked at a press conference minutes after the announcement whether Australia had returned to trend growth he replied "it depends who you talk to". "If you are in resources the outlook is quite bright, there is no doubt the economy is strengthening. But if you see some of the data, parts of the economy are still soft. I'm still cautious if you like. I am confident but I am certainly not complacent." There are two good reasons for the Treasurer to be cautious. One is that the Treasury is cautious. Its calculations suggest that were it not for the stimulus the economy would be going backwards. It would have shrunk 2 per cent in the year to September instead of growing 0.6 per cent. And the stimulus is being wound back day by day. The business investment tax break that flooded our docks with cars ended in December. The First Home Owners Boost ended that month. The Green Loans program was axed in Februray and the home insulation scheme was suspended at the same time. It's easy to see why its worried things will get bumpy from here on. The other reason is a solemn commitment that may soon become operative. Swan, Tanner and Rudd have promised to hold real spending growth to 2 per cent per year once economic growth returns to trend, and to hold it there during the five or so years it will take to return the budget to surplus. If growth was already back to trend the commitment would become operative in the next budget. It they can show that it is not they buy time. They will be able to spend without that restraint in an election year and at a time in which they think the economy will need it. The Bank concludes its statement saying that with "growth likely to be close to trend and inflation close to target over the coming year, it is appropriate for interest rates to be closer to average". Its decision to boost the cash rate from 3.75 per cent to 4.00 per cent is "a further step in that process". The Treasurer and the Treasury aren't so sure.
. Okay, are they going up?